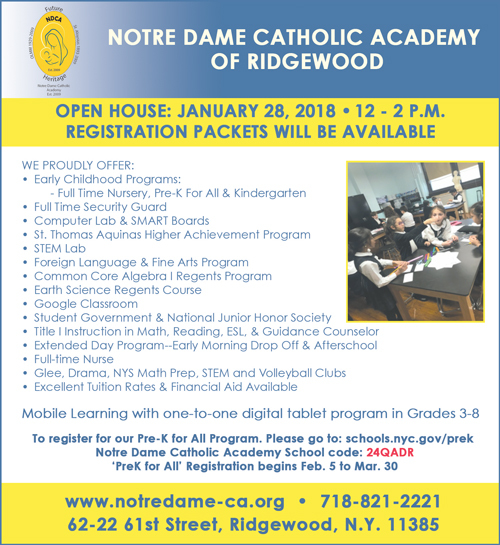 Notre Dame Catholic Academy of Ridgewood is a God-centered community where the diversity of each individual child is embraced and respected. The students from nursery through eighth grade receive a challenging academic and spiritual education that develops the whole child and enables students to become productive, caring members of Church and society. The loving faculty and staff are dedicated to nurturing the mind, body, and soul of all students. They are committed to providing the highest quality education and to provide each student with the resources to become global citizens based on the tenets of Catholic education. The focus is on teaching and guiding each child according to their individual needs and the core emphasis is to teach as Jesus did and share the Gospel values with everyone. Using the new state-of-the-art STEM Lab, teachers are able to provide students with a rigorous learning environment and advance students in the areas of science, technology, engineering and mathematics. Every student in grades three to eight is issued a tablet to use during the school day. With this program, there are more enhanced opportunities to develop the innovation and creativity of students. This program is in addition to the use of SMART Board technology as well as the technology lab. The academy proudly offers both Common Core Algebra I and Earth Science Regents courses to eighth graders and administers the Regents Exams in June. Students are also accepted to many prestigious Catholic and public high schools. The recent graduating class earned over $205,000 in Catholic high school scholarships. Dedication to Catholic education is a strong, driving force at Notre Dame Catholic Academy. It is a community that practices and shares its faith. Students participate in monthly liturgies, daily prayers, and special prayer services. NDCA is also a school dedicated to service. Throughout the school year, students collect food, clothes and money for different charities. In addition, the academy proudly offers a free Pre-K For All program.